New York…Demisch Danant is pleased to announce I AM I, an exhibition of ceramic works by celebrated Belgian artist-designer Jos Devriendt. Comprising more than 60 unique lamps, vessels, and objects, the presentation will be Devriendt’s first solo exhibition in New York City. On view from October 26 through December 15, 2017, I AM I continues Demisch Danant’s exploration into European design since the 1950s, through exhibitions, publications, and programs that connect postwar and contemporary advances in form and technology as points along a continuum of cultural change. For the past 20 years, Devriendt has been working with the mushroom as an archetypal form translated into functional sculpture. Part of an ongoing series known as Night and Day, Devriendt’s lamps express his interest in the ways in which time and atmosphere can transform our perception of objects and contexts. 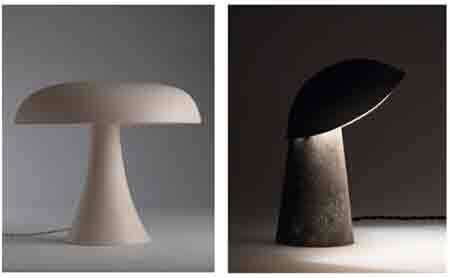 Deftly rendered in porcelain, each lamp is a mushroom-like form illuminated in the daytime by natural light that filters through its delicate porcelain. At night, the same works appear to morph, abstracted by the glow of electrical illumination from within when a switch is turned. The color of each piece changes and further redefines its scale, and its place in time and space. I AM I will also include a selection of small sculptural objects, each expressing Devriendt’s relationship to minimalist sculpture and his commitment to deceptively simple forms as vehicles for visual, intellectual, and emotional conditions. Born in Ostend in 1964, Belgian designer Jos Devriendt works are based on a late surrealistic concept. His industrial designs are handcrafted and present simple solutions for rather com- plex problems. Devriendt studied ceramics at the LUCA School of Arts, and sculpture at the Academy of Fine Arts, Ghent. Demisch Danant was founded in 2005 by Suzanne Demisch and Stephane Danant. The gallery specializes in twentieth century French design with an emphasis on the late 1950s through the 1970s and represents the work of Maria Pergay, Pierre Paulin, Joseph-André Motte, Pierre Guariche, Michel Boyer, Antoine Philippon and Jacqueline Lecoq, and René-Jean Caillette. Curated exhibitions on historical work are presented within environments that reference architecture and interiors of the era. Demisch Danant is dedicated to research and scholarship on French design and has authored and published monographs including Antoine Philippon and Jacqueline Lecoq and Maria Pergay: Complete Works 1957-2010. Current projects include a comprehensive monograph on seminal designer Joseph-André Motte, and a new book about the architectural commission works of artist Sheila Hicks. Demisch Danant is open to the public Monday through Friday, 10AM – 6PM; Saturday 12PM – 5PM.